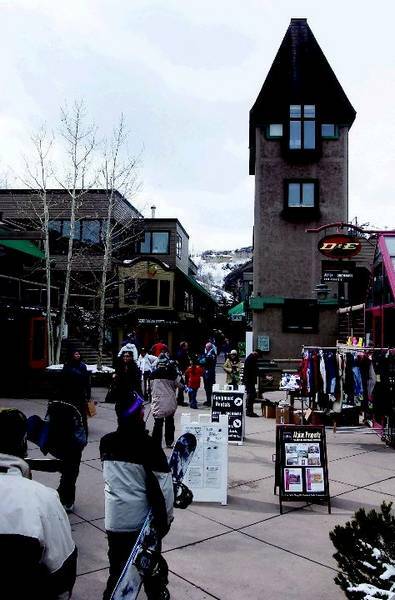 An unnamed buyer is negotiating to purchase the original part of the Snowmass Village mall, which includes the signature Tower building as well as the newer Gateway Center, for redevelopment, according to a local real estate agency. Aspen Times photo/Paul Conrad. News of the Snowmass Village Mall’s demise have been greatly exaggerated.Three blockbuster deals are in the works to transform the 1970s-era development into an updated mixture of residential and commercial buildings. The redevelopment is being spurred by the recent approval of Base Village slightly farther downslope.One buyer has two huge portions of the mall under contract for purchase, according to Terry Griggs, an agent with Snowmass Real Estate. The buyer is negotiating to purchase the original part of the mall, which includes the signature Tower building, and the newer part of the mall closest to Snowmelt Road.The old part of the mall is owned by a corporate entity called Snowmass Village Mall Properties. The newer part of the mall, an addition called Gateway Center, is owned by John Francis.Griggs, who is handling the sale with his wife, Louellen, said he couldn’t disclose the prospective buyer or the asking prices. Word is that the Gateway Center is under contract for $9 million while the asking price is $14 million on the older portion of the mall, according to a leading broker who asked not to be named.Griggs said the Gateway portion of the mall had been listed for sale. The original part of the mall wasn’t officially listed. It was built in 1967; Gateway Center was added in 1988. The parcels went under contract in early February. The prospective buyers are apparently optimistic about closing the deal. A flyer was circulated among current mall business owners last week notifying them that potential new owners would meet with them on March 23.Separate slopeside projectIn a separate deal, longtime local developers Jim Light and Jim Chaffin want to consolidate land they own with adjacent property for a new project slopeside on the mall.Light and Chaffin own about one acre at the center of the mall where their business, Snowmass Real Estate, is located. Light said they are working with the owners of the adjacent Timbermill building and the owners of the Snowmass Inn, on a street one level below the mall, to consolidate land for a project.Light said they would like to build a 36-unit, high-end, fractional-ownership residential project similar to the Timbers Club in Snowmass Village. The units would be sold in anything from one-fourth to one-eighth interests, similar to what Light and Chaffin did with their high-end Roaring Fork Club outside of Basalt.”We want to distinguish this as a second home as opposed to a timeshare,” Light said of the project’s residences. The Moebius family, owners of the Snowmass Inn, and Lance Hool, owner of the Timbermill building, “are of a like mind” regarding the type of project they want, according to Light.Optimism for mallLight noted that the Snowmass Village master plan contemplates scaled-back space for bars and restaurants at the old mall because Base Village will be the focal point of town. It’s easy to imagine the mall as housing. Property above it and below it already holds hotels and condos.”Base Village would become downtown the and mall would be a neighborhood,” he said.In the best-case scenario, Light, Chaffin and their partners would like to start redeveloping by 2006.Voter approval of the Skico’s Base Village project last month was widely regarded as a death-knell for the old mall. Base Village includes 610 hotel rooms and condominium units, as well as 64,000 square feet of bars and restaurants. Work will begin on the first phase of the 1 million-square-foot project later this year.